Did this for Litian’s wedding for myself! I always had my polishes on for months before I changed it off as it was uber difficult to do for oneself and that night I was super tired after all the preparation work. With flash. (Colour truer to without flash pic) Close up. It wasn’t really properly done as I mentioned just now I was super exhausted hence the results were urgh ): Went over to Litian’s one day before her wedding to help her with her nails! Before the extravagant nails haha. After shaping and cutting cuticles. 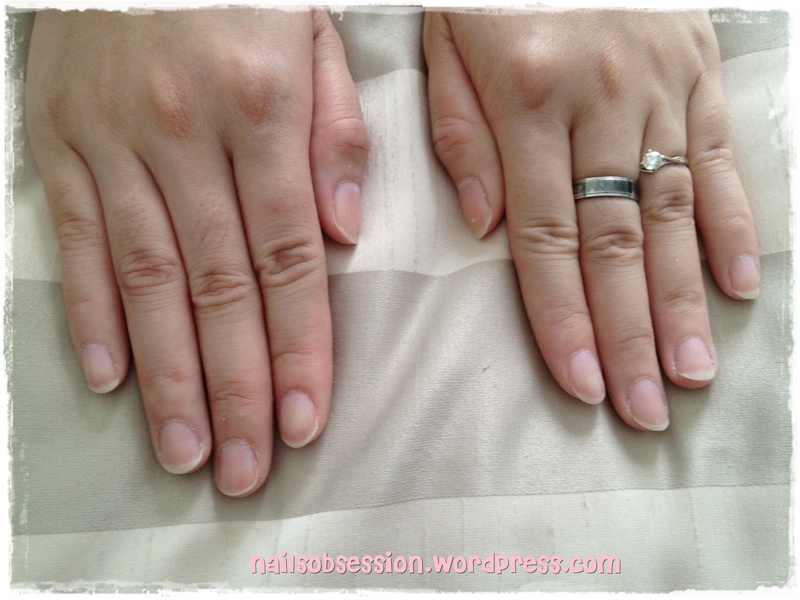 See how big a difference it is when you file your nails properly? I realized a lot of girls don’t file their nails and I have no idea why?! Don’t be lazy, always file your nails after cutting them so they’ll look neater. 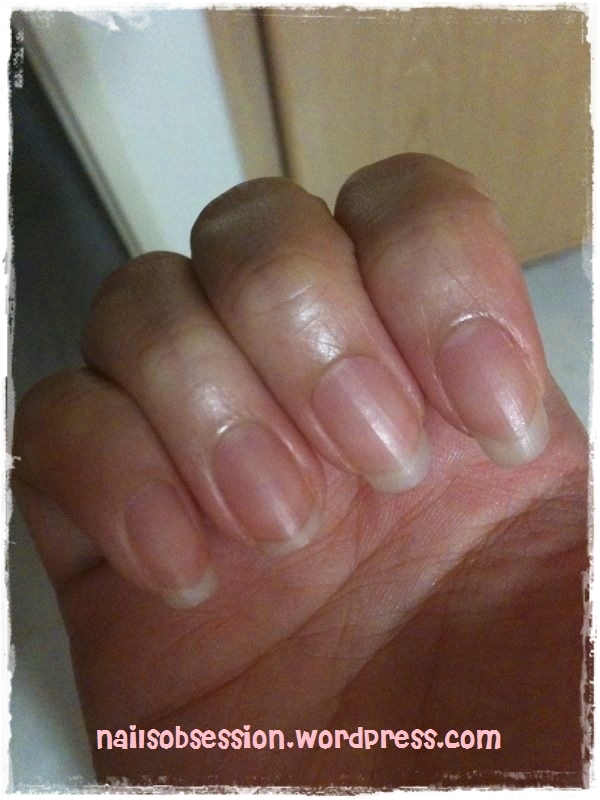 In fact, I don’t usually cut my nails I just file them to the length I want! 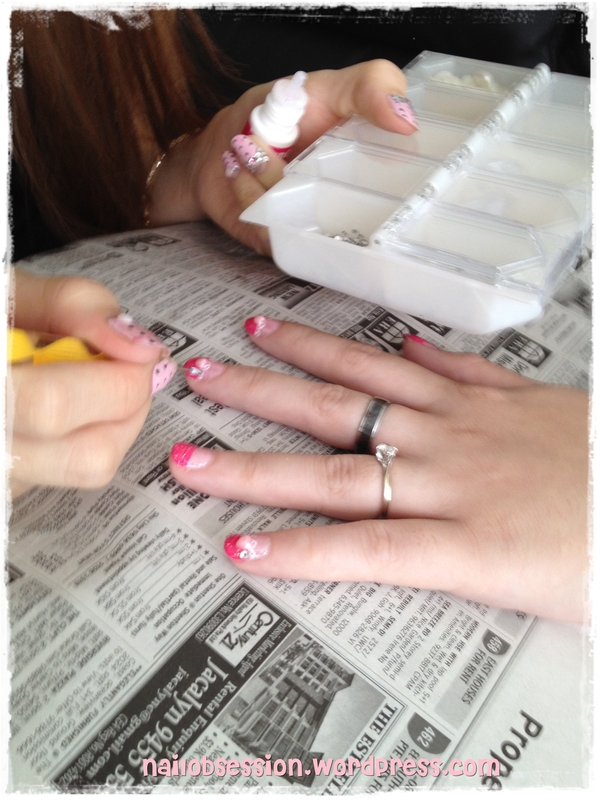 In the midst of doing her nails.. And yes I still have my Dollywink nails on! Didn’t bear to change them out cos’ I really love the crystallized ribbons! While I was painting her fingernails, ps was painting her toenails! Hahahaha. And ta-da! End result of her toenails. I did the nail art but base was painted by Ps, not too bad for a guy right? 😛 This was what I did for her nails – Victorian style bridal nails. (: The lights were too bright lol! I only realized this after I looked at the pictures! She accidentally pressed against her nails before I took the pic hence the “crumpled look”. My favourite part, the big pearls and crystals! Super blingy I super love it (: With flash. Close-up. Some of the nails chipped off, but it still looks good on her! With flash. 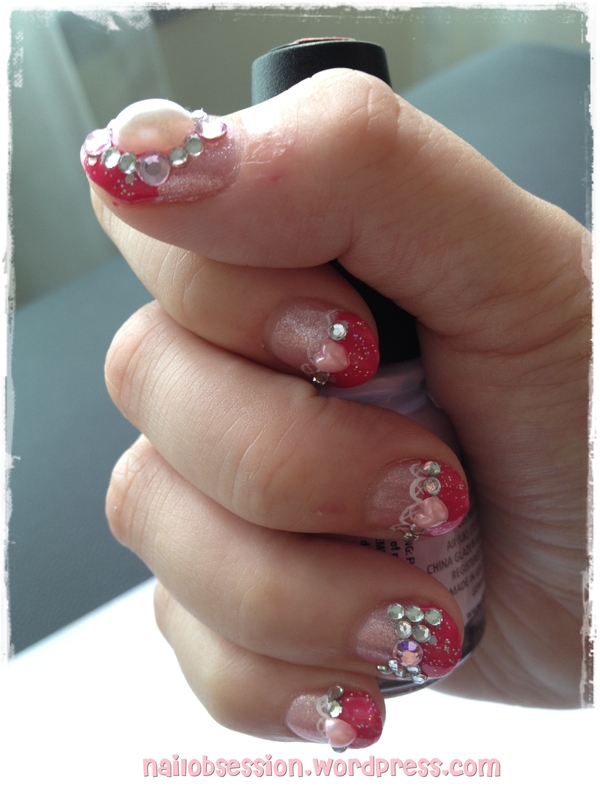 Jessie also did the same set of design but in strawberry pink, so I call it the Strawberry Dollywink nails! With flash. Close up. The design still looks good on her cos’ her nail bed is considered long although her nails are short in overall. Lastly I did leopard prints for Shini. Heart leopards surrounded with crystals on her ring finger and pink leopard prints on the rest. A colour that I’ve not done before, looks very wild and suit her a lot! Without flash With flash Close up.